Welcome to the E3 Building Concepts Blog! Since this is the first blog from E3, I feel that it is only fitting to introduce the company. First and foremost, what does E3 stand for? It stands for Building Elements, Environment, and Efficiency. These are the three key components of any building that work together to provide us a comfortable, affordable and safe living and working space. E3 is a consulting firm based in building science that understands how each and everyone of these components work together. Our services currently include indoor air quality investigations, green/sustainable consulting and verification, energy audits and Energy Star verification. While many companies are popping up around the area providing one or more of these services, I assure you that E3 you will provide the most professional, educated, and thoughtful service each and every time. As the owner, I have been in the construction and building science industry since 2002 and have worked on projects of various sizes investigating and correcting issues with the building environment -- well before energy efficiency and "green" became a catchphrase! I have attained multiple professional certifications and hold a Bachelor's degree from N.C. State that all benefit me in my daily work with building science. Each week I will post my thoughts, knowledge, and opinion on related items and events, as well as a new recommendation for reducing the energy consumption of your home. I hope you will find this blog helpful and insightful in an ever changing industry! Cut off ceiling fans when you are not in a room!!! This is one item that I constantly go over with individuals in an energy audit. A ceiling fan is a great way to help reduce your cooling cost in the summer time, but only if you are in the room with the ceiling fan! Ceiling fans cool the person, not the room, by air movement across your skin. The air movement generated by the fan causes you to cool down, not the room. If you leave the fan on when you are not in the room, you are actually generating heat through the motor and wasting electricity. 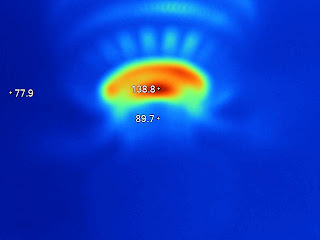 Below are two thermal images showing the heat generated by the motor. The image on the right is blended so that you can see more of the fan. The room temperature is 78 and 80 degrees at the ceiling. 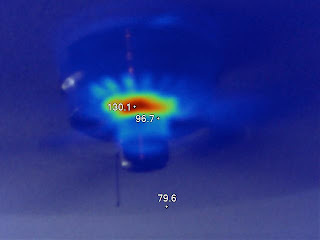 You can see that the fan motors are 139 and 130 degrees. This is adding an ample amount of heat to these rooms and not cooling anything down. So next time you leave a room, remember to not only cut off the lights but the fan too!